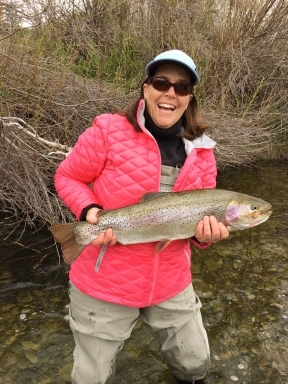 The fishing has been excellent in the Box Canyon. The Box has come down to 600 cfs and is expected to remain so through the weekend. While we have not seen adult Salmonflies in the Box yet the fish are keying on Rubberlegs. Black #6 and #8 Rubberlegs will keep you busy in the box. The Box Canyon is a great option if you want to avoid the Salmonfly madness on the lower river. I would also suggest looking around McCrea’s Bridge and lower Coffee Pot. Both these areas are often ignored this time of the year but can produce some amazing fishing. We’ve also had some great reports from the Henry’s Lake Outlet but it has been crowded. Our advice is to access this water from the Flat Ranch on Henry’s Lake Flat. 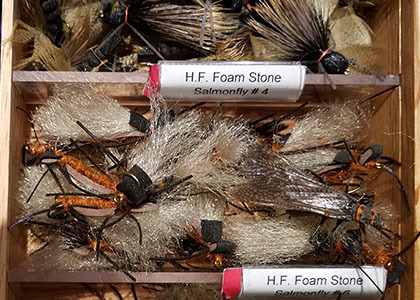 The lower Henry’s Fork has come alive with Salmonflies. It’s always exciting to see these big prehistoric insects! It’s also amazing to see large trout throw caution to the wind as they crash the surface and inhale them. 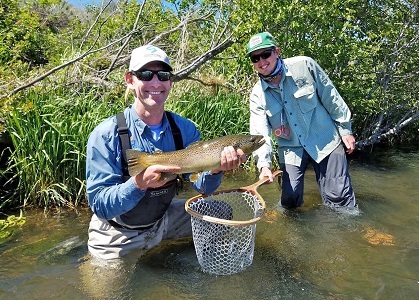 As most of you know the river becomes a mad house with anglers from all corners of the country it’s important to be courteous and remember proper fly fishing etiquette. Try to be patient with one another and I think that maybe asking a few questions at the boat ramp is always a good idea. Etiquette from river to river varies, I have been on rivers where cutting directly in front of another anglers seems to be OK. On the Henry’s Fork that is not the norm. Give another angler at least 100 yards of river bank before you cut in and 200 yards is even better. The Henry’s Fork also has lots of wading access. Try not to run over wade fisher’s water. I also think it’s a good idea not to cast in the wade fisher’s water as you float by. If you see boats anchored up casting to working fish or even if they are just sitting in the boat pull your line in and let them have that area. I will generally give boats that are anchored 50 to 60 yards before I start casting again. 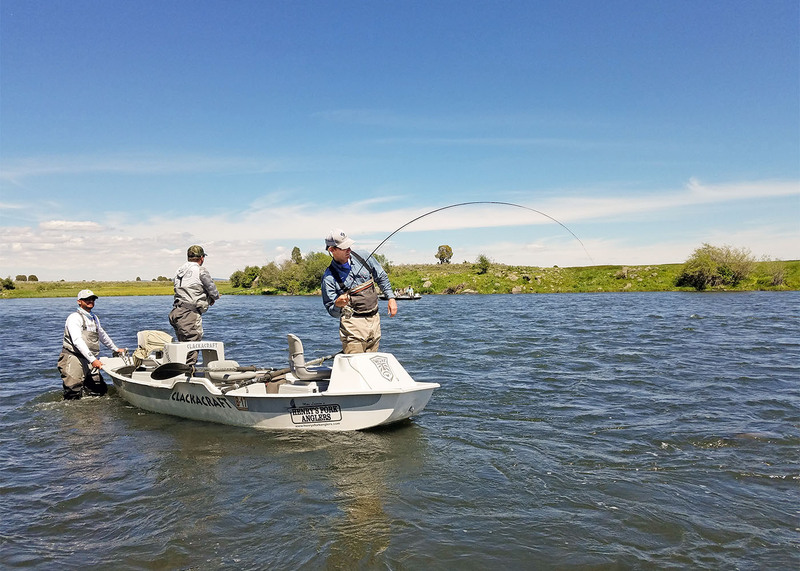 While wading in the Henry’s Fork be mindful of drift boats and don’t be afraid communicate in a respectful way that you have working fish in front of you. Hiding in the brush and leaping out at the last second and yelling at people at the last possible second is not productive for anyone. I think communication and a little patience goes a long way on the river. Keep in mind that the Henry’s Fork is about the only game in town right now and will probably be that way for a while. Rubberlegs and Mikes Henry’s Fork Foam Stones are working great from the Riverside area on down to Chester. I would have #4 and #6 Foam Stones and a bunch of #6 black Rubberlegs. A dry dropper will work well on the shallow banks and a double nymph rig has really been working in the deeper runs. The South Fork has come down to about 10,000 cfs and while the water is dirty the fishing has been fair. It’s a nymphing game for sure. A #6 black or brown Rubberlegs with a #12 or #14 red Copper John or a #16 red Lighting Bug should do the trick. I would stick to the upper end of the South Fork as the water will get dirtier the lower down river you go. The Teton has really begun to come up again as this week warm weather started some big time snow melting. The flows at St Anthony are 2,750 cfs as of this morning. The cooler temps today may bring that level down a bit but for the most part it may be awhile before the Teton levels out. The Madison has started to fish this week. The wade section has about 3 to 3.5 feet of visibility and the fishing is good. If you’re planning on visiting the Madison this weekend than I would make sure to have Rubberlegs and San Juan Worms. If you plan on a float I would stay above Lyon’s access. Lyon’s down the water is really dirty. The Park will open tomorrow. We have park licenses available at the shop so swing in and get what you need for a great day in the park. Expect most of the water to be high and off-color. The Firehole will likely be your best option. Swinging soft hackle flies through the riffles will usually produce fish even if the water is high.